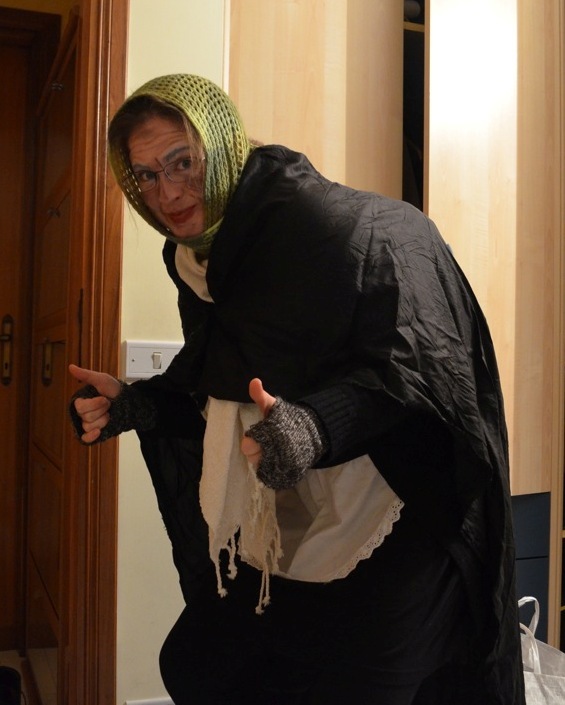 We decided to throw party for all the neighborhood kids last night and yours truly played the role of La Befana, an old haggard woman who goes from house to house delivering stockings full of candy (if you’ve been good) or coal (if you’ve been bad). A loud *CRACK*, a cloud of smoke, and a flash of red light announced my arrival on the terrazza. I got off my broomstick and dragged my sack into the kitchen where nearly 20 kids waited eagerly for their stocking which, by magic, had their names written on them. Half woman, half witch, La Befana is old, extremely ugly, and known for startling children by coughing and sneezing when they attempt to give her a kiss…which they must do in order to receive their stocking. This was by far my favorite of the Italian Feste during the Christmas Season, and it’s really too bad that La Befana never made it into American culture. I know a few dads & uncles who would leap at the opportunity to dress up as an ugly witch and scare little kids! **Translation: La Befana comes at night with completely broken shoes and Roman dress. Long live La Befana!! As with most poetry, this chime is ten times better in its original language.